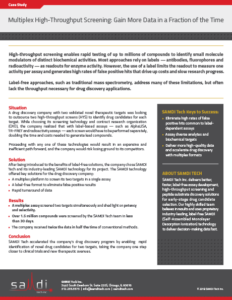 Choosing SAMDI Tech for your high-throughput screening project will accelerate your discovery program. Get high-quality data at high-throughput speeds with our better, faster, label-free approach. Assess hit rates to determine the optimal concentration of small molecules to use in your screen. Screen from our one million compound deck and/or your own library to identify small molecule modulators for your target. Confirm hits identified in your HTS for added confidence. Characterize your hits in dose-response curves. Evaluate structure activity relationship (SAR) and identify critical moieties for optimal target engagement. Learn how SAMDI Tech accelerated a company’s drug discovery program by enabling rapid identification of novel drug candidates for two targets. Find your next drug candidate.